This was the best place we stayed in our whole trip to Morocco. The breakfast is absolutely delicious and you can have it on their lovely roof terrace. The riad is really beautiful and the location is excellent and great value for money. It is just off the main square in an interesting street. 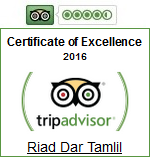 The riad is very peaceful and a lovely place to relax with friendly and welcoming staff.